New Neighbor Contest Enter To Win!!! 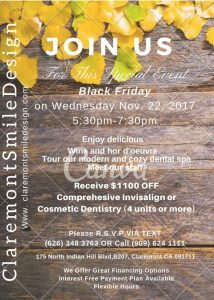 Claremont Smile Design invites you to join our dental family and to take advantage of our current promotions and top quality care & services. All new patients seen between 10.19.16 and 12.20.16 will be entered to win a grand prize! We look forward to meeting you and to helping you SMILE! Enter your basic information below to be considered for the contest!